Fall is my favorite season: the stunning colors of autumn, the sound of leaves rustling in the wind, and the return of college football. And shopping! Though my school days have been over for a few years now, I still love the excitement that back-to-school shopping evokes. Fortunately, my role as Urban Forestry Manager allows me to do some shopping in preparation for the fall planting season. One of my responsibilities is locating and coordinating the purchase and delivery of trees. Trees at Ruppert Nurseries. This is where many urban trees come from. For each spring and fall planting season, Casey Trees purchases an average of 500 trees for its planting programs – Community Tree Planting (CTP) and RiverSmart Homes (RSH). Trees come in many sizes and shapes; but pretty standard, Casey Trees plants two-inch caliper, balled and burlapped (B&B) material. The caliper measurement refers to the diameter size of the tree’s trunk. In the nursery this is measured at four inches above ground for trees less than four inches in diameter. The term "balled and burlapped" refers to the root form of the tree, where the root ball is lifted out of the ground and encased in burlap until planting. B&B trees have their advantages and disadvantages over other types such as bare root and containerized trees. The main disadvantage of B&B material is that a large portion of the roots may be severed at harvest time. With the reduced root system, water is a critical element in the successful transplanting of B&B material. Casey Trees provides a slow-release watering bad for each tree it plants to encourage caretakers to water the recommended 25 gallons of water per week during the growing season. The last few seasons we procured trees "blindly" from nurseries in our region. Trees were dug from the nurseries’ fields and delivered to our yard, and that was our first time seeing them. We had developed good relationships with these nurseries and the material they delivered was reliable and good for our needs. However, this year we decided that we might be able to do even better by hand-selecting the trees ourselves by visiting the nurseries and "tagging" trees. 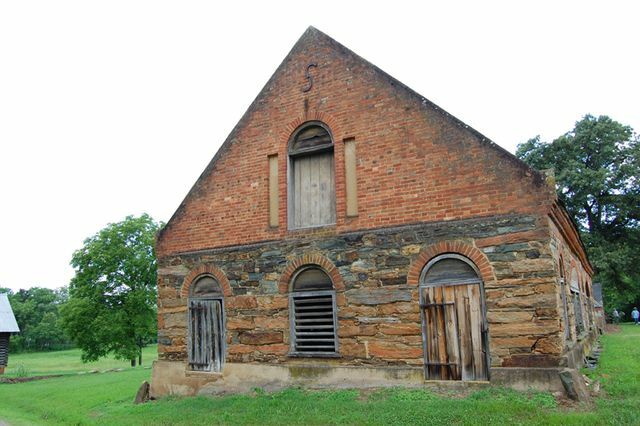 The barn at the historic Bremo Plantation - one of three sites where we buy our trees. A strong leader (that is, a leading stem that will support the tree as it grows). A full crown making up two thirds of the tree. Good trunk taper - tapered trunks withstand greater amounts of stress than trees without. A root flare at the proper depth. Each nursery was a delight to visit and each was uniquely different. Angelica Nuseries is located on the scenic Eastern Shore of Maryland. Bremo Trees is not too far from Mineral, Virginia (the epicenter of the recent earthquake) and is part of Bremo Plantation, a registered historical site. Ruppert Nurseries is just 25 miles from our office in Laytonsville, Maryland. I didn't have tagging seals yet, so colored marking tape sufficed. Sometimes it was pink, checkered, or purple. At one nursery, the color pink meant the tree was up for slaughter - shredded and mulched. Digging out a B&B tree for planting. We're looking forward to our fall planting season and can't wait for the first shipment of trees. You can volunteer with us at planting events this fall or participate as a homeowner in our RiverSmart Homes program if you want to see these beautiful trees in person.